john4jack (Corvallis, Oregon, United States) on 25 August 2009 in Business & Industry and Portfolio. Charleston Harbor has its Fisherman's Wharf, but it certainly isn't San Francisco. Happy Silly Tuesday. USE YOUR HISTOGRAM - On his blog yesterday, David duChemin talked about "Exposure and Metering"; http://www.pixelatedimage.com/blog/2009/08/exposure-and-metering/. His main point was that we need to pay way more attention to our histogram than what we see on the LCD screen. Here is a crucial quote, "the right half of the histogram is capable of storing exponentially more information in it than the left half. WAY more information. And the right quarter of the histogram, WAY more than the other three combined. How much more? Again, I’m simplifying, but if the right quarter of the histogram can hold 2000 levels of information, the quarters to the left of it can hold 1000, 500, and 250 respectively. There isn’t much information at all in the darks. That right quarter of the histogram can hold twice what the rest of the entire histogram can hold. It’s a WAY bigger bucket, can hold more information. More information means better image quality and more flexibility in the digital darkroom before noise becomes an issue." This is why all of the pros say, Expose to the right. If we expose to the right (without clipping), we will be capable of producing far, far better exposed photographs. Awesome image Jack! The reflection on the water is so sharp and crisp I had to do a double take! Great and this looks a lot cozier than San Francisco! @SCOTT F. SCHILLING: Thanks, Scott. Whenever I see the words, Fisherman's Wharf, I automatically think of SF; I'm programmed that way. Charleston Harbor does have some sailboats (you can see some masts in this shot), but it is essentially a working boats harbor. PS - that albacore tuna is fabulous! Ah, "Fishermen's" Wharf...no, it ain't San Franciso's Fisherman's Wharf. And look at that Crab at $5.65. I'm glad you caught this image and its pristine reflection. Marvelous. For my take on Silly Tuesday visit HERE. @djedfre: In that respect, it's a real winner. The fish is incredibly fresh. Outstanding clarity, the stillness provides a stunning reflection. I had to laugh at your appropriate title. Hardly room for the crowds but there appears to be a lot to offer in this small package. I've not been able to visit or reply these last few days but I just made it (50 minutes late) to add my post for Silly Tuesday. Happy Silly Tuesday Jack!!!! This is a wonderful shot and just silly with it:-) Thank you for the information...fascinating! at the place or upside down! While the sky is gray mine! image is magnificent! Great ! beautiful colors and reflections ! Great shot...nice reflections! So what if it ain't SF! Love your colors and the signage that makes this a quaint capture. The reflection is perfect. 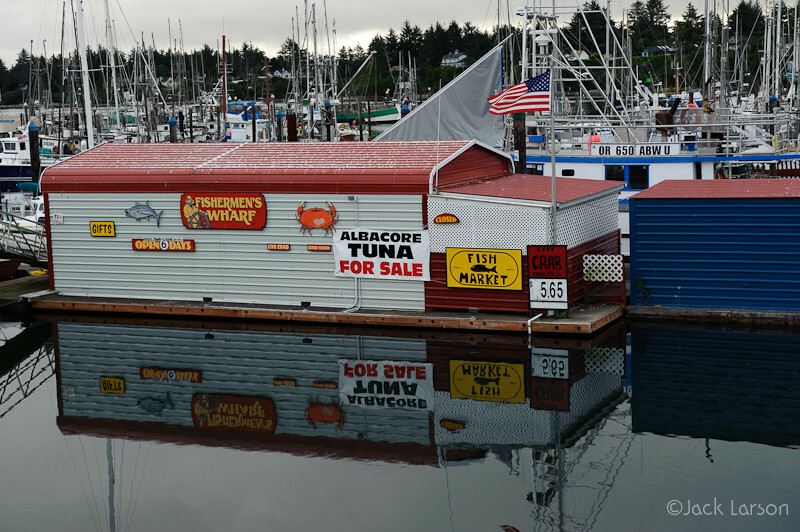 I first thought I read "AUNT" in the reflection of the "TUNA" sign. Awesome reflection! I just love all the stuff that goes on in a "working" harbor (as opposed to the "luxury" harbor we have in Santa Cruz) Also, Excellent advice! I need to pay better attention to my histogram! Great mirroring here - nice one!! Super shot ! Reflection is brilliant ! Beautiful shot with the reflections -- so still is the water. Great one, but no, it's not SF. A fine shot with excellent reflections. I like the signs on the floating store. Thanks for the tip on the histogram's importance! As to histograms, I am too old for them. I still photograph the way I always did. Who looks at histograms while they are shooting? I expose the shot for what I want out of it and not to make a pretty histogram. @Michael Rawluk ht: The point is not a "pretty" histogram. Rather it is that in a digital camera, it is your primary source of information. If you go by the image that you see on the LCD screen (a mediocre in camera jpg rendering), you most likely will have more noise than need be. If you don't look at your histogram, and if it is not weighted toward the right, like it or not, you are throwing away valuable data. Unless I am shooting action shots, I use my histogram all of the time; it has proven to this almost 74 yr. old to be invaluable. I must admit, however, that you produce some outstanding photographs without using your histogram. wonderful reflection ,jack ,I board thought it was a boat! Really an amazing composition. Poles in the back, a house and reflection in the still water... everything is so very well composed and placed. @Anna.C: Thanks. Me, too, on fish and crab; I love all seafood. Great shot with superb reflections, Jack. Thanks too for the histogram info ... very interesting! @Judy: Thanks, Judy. On the histogram, it is well worth reading the entire blog. joli coup d'oeil sur ce reflet. That's a mighty small fisherman's wharf!!! A strange place for a fish market. Beautiful reflections. Wow the reflections are awesome - so crisp and clear, and not even a 'ripple' in the water. Fantastic shot! And thank you for that lesson! I will definitely pay more attention! Fantastic reflection, Jack!! That histogram always gives me a headache trying to figure it out LOL!! But that info is most definitely helpful. Great shot and reflection. Almost looks like selective coloring. It is so brightly colored compared to the rest of the shot. Mmmm ... tunasteak tonight ... love it! Great reflection! @Monique: Thanks, Monique. Our photo guild had its annual bar-b-q last Friday evening. We had marvelous tuna steaks. Thanks, Jack; I read the entire blog on the histogram - copied and printed pgs 6-9 of it to study! @Judy: Digital is a whole new world! It's really hard for me to shoot to the histogram and not the image on the LCD.